Welcome to my photography blog, where I share my experiences, professional and personal journey. In October 2018 I attempted to explore the human relationships with the land through photographs. The selection of black and white analogue prints shows the start of autumn months in North Bath. Aim was to portray how the human impact has sculptured shapes in the landscape. There is a noticeable absence of people on the photographs. Nevertheless, a human presence is observed through the footprints left on the landscape which encourages to look at all of humanity’s connection with the environment. The photographs highlight features of amenities that represent connections between the urban environments and the land. Distinctively straight horizon, symmetric transmission tower, seamlessly parallel power lines which vanish into the misty horizon of the distance – they are an important reflexion on our influence on Earth. Instead of focusing on the wider view only, images focus on the intimate and personal detail. Reducing the number of motifs within images creates a minimalist environment and improve composition. 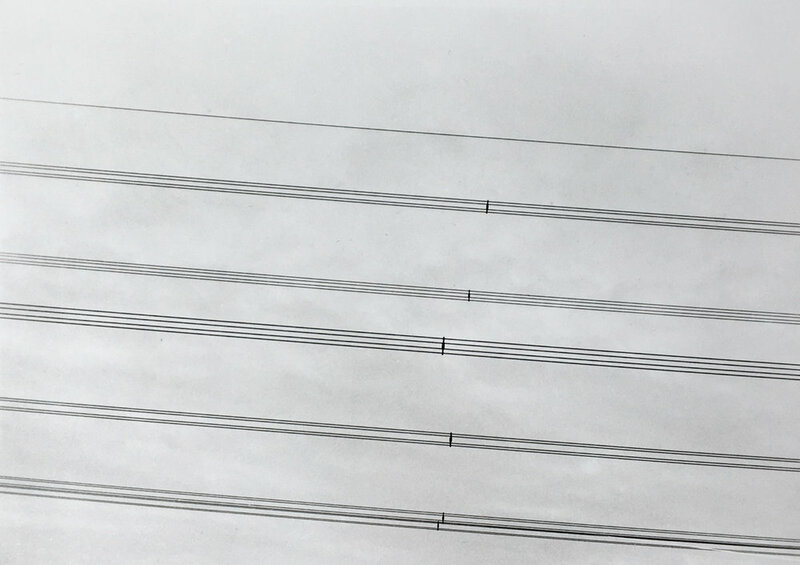 The perfectly parallel power lines dominate in the neutral foggy sky which retained its details in the whites. The stone fence draws the viewer towards the centre of the frame before petering out of sight. The wind turbine is freestanding amidst overpowering stillness. The images reveal aesthetically pleasing post-cultivation landscapes countered by the bluntly precise geometric shapes. The conflict between the landscape’s features and the uniformed shapes raises awareness of the human impact on the environment. The vanishing lines into the horizon help us question where our control over the land will lead.